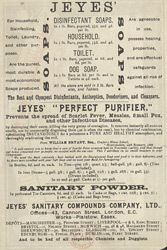 John Jeye developed a strong disinfectant in the 1870’s. He was horrified by the poor living conditions of many city dwellers, he saw that poverty, disease and pollution were widespread and felt that disinfectant could be used to stop the spread of these conditions. Jeye’s Fluid was the first of many disinfecting products. Jeye’s was acquired by Cadbury Sweppes in 1972.